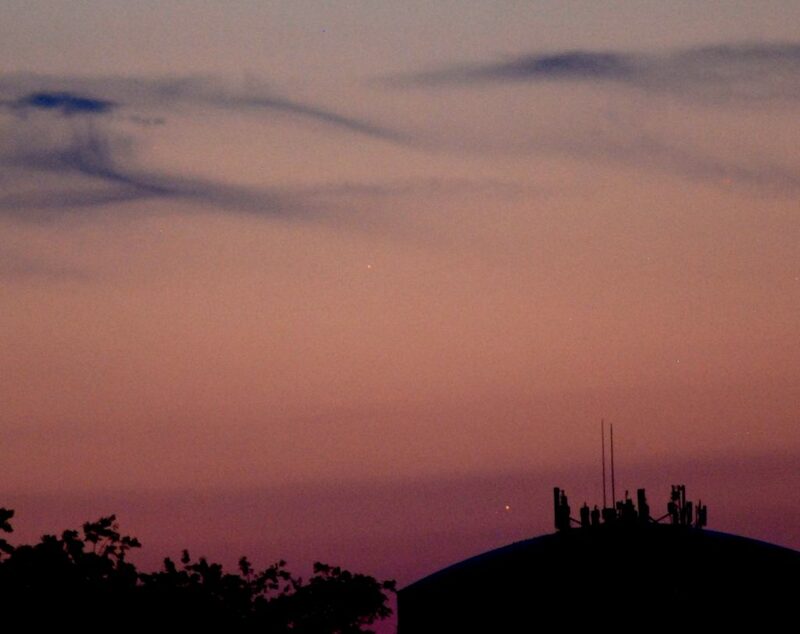 In the Summer and Fall of 2016 Venus was in the western sky in the evenings. It had a close encounter with Mercury. Here Mercury is just over a degree above Venus, photographed on August 17th, 2016. I followed Venus through its Eastern elongation at the end of 2016 and into 2017. I already have results for two Eastern and two Western elongations, and they contain enough information for me to take a stab at finding the eccentricity of its orbit. The four previous distances from the Sun that I have measured are 0.7277, 0.7188, 0.7225, and 0.7203, all in astronomical units. I am hoping the uncertainties are a few in the last decimal place. What I would really like to do is to measure the distance of Venus from the Sun at perihelion or aphelion, but I have no control over this. All I can do is keep on measuring the distances at maximum elongations and hope that sooner or later one of them falls close to aphelion of perihelion. Obviously, the numbers to look at are the largest and smallest values. My best estimate (see chapter 16 of the book) for the semi-major axis, a, is 0.72333 ± 0.00006. If I combine this with the first of my values, assuming Venus was at aphelion, I calculate an eccentricity of 0.0060. The smallest of my values is 0.7188. If I suppose Venus was at perihelion for this elongation, I calculate an eccentricity of 0.0063. These are encouragingly close and I can certainly treat 0.0063 as a lower bound on the eccentricity. What I did in 2017 is to continue the measurements as Venus went through its retrograde motion. I have never done that previously. 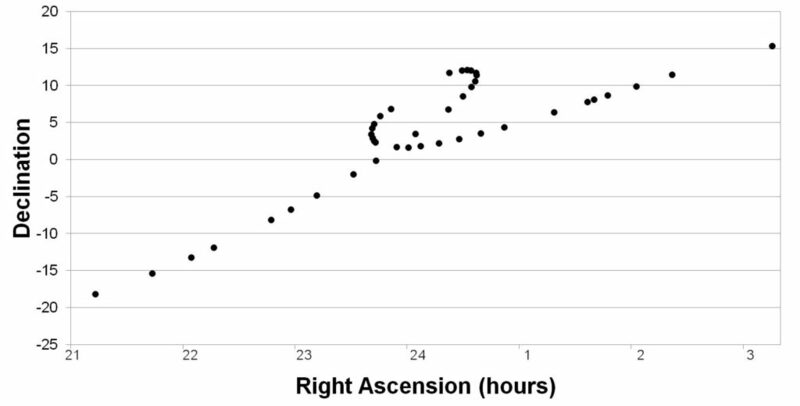 A way to show the results is a graph of the retrograde loop plotting the declination versus the right ascension. An extra bit of data from this set of measurements was another pair of values of maximum elongations, both eastern and western. For each I have values of the date of maximum elongations, the value of the separation from the Sun, and the heliocentric longitude of Venus. This gives me six sets altogether, and I felt this was enough for me to make a more elaborate analysis than I had previously tried. The elliptical orbit is described by three parameters: the semi-major axis, a, the eccentricity, e, and the longitude of perihelion. I have a very accurate value of the semi-major axis, described in chapter 16 of my book, so I needed to find only the other two parameters. My first approach was a bit casual. I wrote a non-linear least squares fitting program for the two parameters, and started it running at a rather arbitrary pair of values. The least squares process didn’t converge well and the answers drifted as I increased the number of iterations. So, instead, I set up a fairly dense grid of values of the two parameters, and calculated the quality-of-fit parameter, χ, for each grid point. From that, I could pick out a pair of values that I could see were close to optimum. I started the least-squares program from that point and it converged very quickly to give values of 0.0066 ± 0.0002 for the eccentricity, and (126 ± 2)° for the longitude of perihelion. With these results, I really have values for all the properties of Venus that I can measure. The big one that I am missing is the mass. As I said in my book, the only way for me to measure that would be if Venus had any moons, which it doesn’t. Historically, the way around this was to study the perturbations produced by Venus in the elliptical orbits of the other planets. This is beyond the precision of my results. I am feeling pleased if I can just show that the orbits are close to elliptical. I can make a guess at the mass of Venus by assuming it has the same density as the Earth. From my values for the mass of the Earth and the diameters of Earth and Venus I estimate a mass for Venus of about 5e24 kg. This is actually correct to one significant figure, but it really is just a guess. If I apply the same reasoning to Mars or the Moon, I get quite an over-estimate.